British Army officer in the First World War. 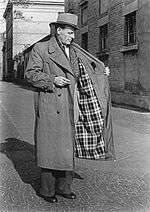 A lined trench coat being modeled in Eastern Germany, 1953. 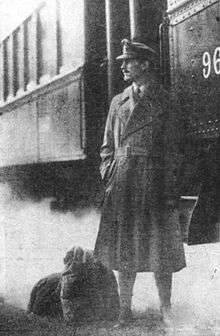 During the Second World War, officers of the United Kingdom continued to use the trench coat on the battlefield in inclement weather. 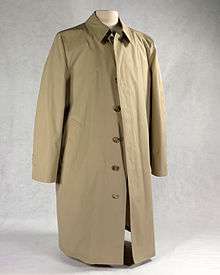 Other nations also developed trench coat style jackets, notably the United States and Soviet Union, and other armies of continental Europe such as Belgium, France, Germany, Greece, the Netherlands, Poland (and are often seen in war zone photographs in the 1939-40 era, even worn by troops on the attack), although as the war progressed, in the field shorter "field jackets" became more popular, including garments such as the Denison smock used by British commandos, paratroopers, and snipers and the M1941/M1943 field jackets used by the US Army. These garments were shorter and more practical than the trench coat, and as such they allowed the wearer to be more mobile. While similar, the heavy metal and Goth fashion trend of black oilcloth dusters are usually (incorrectly) referred to as trench coats. Early media reports of the 1999 Columbine High School massacre initially associated the perpetrators (Eric Harris and Dylan Klebold) with members of the "Trenchcoat Mafia," a group of outcasts who allegedly wore conspicuous black Australian oilcloth dusters. In the copycat W. R. Myers High School shooting days later, it was rumored the shooter had worn a trench coat. In the wake of these incidents, many public schools in the US forbade students from wearing trench coats, on the grounds that they could be used to conceal weapons. ↑ Fashion, Burberry Store. "Burberry - Heritage Trench Coats". Burberry. Retrieved 2016-03-04. ↑ "Heavy Metal Fashion Returns". METALEATER. 2006-03-24. Retrieved 2008-08-01.